The adage that “war is hell” has shaped much of contemporary Hollywood cinema, certainly post-Vietnam, that has chosen to tackle massive armed conflict. And that maxim will certainly be dragged out, entirely justifiably, in most reviews of Lone Survivor as the film does indeed serve up gripping, grueling battle sequences. In fact, from the second act, on it’s actually largely one extended firefight. But the gut-punch gift of director Peter Berg’s punishing true-life action drama is how it locates intimacy and fraternity, and mines deep reservoirs of feeling amidst much frenetic mayhem. Not unlike Gravity and All Is Lost, two of 2013’s more notable films, Lone Survivor is another big screen tale that exists at the intersection of existential crisis and extreme physical duress. Adapted by Berg from a memoir of the same name, the film unfolds in late June 2005, during the Afghanistan War. The American military has finally received actionable intelligence on a Taliban leader, Ahmed Shahd (Yousuf Azami), responsible for the murder of many Marines. Under the leadership of Lt. Mike Murphy (Taylor Kitsch), a small, elite group of Navy SEALs is tasked with a special kill-or-capture mission for which they night-parachute deep into Taliban-controlled territory. 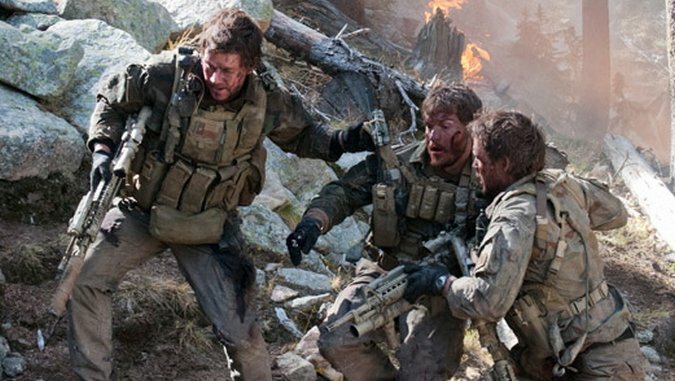 Joining Murphy are Marcus Luttrell (Mark Wahlberg), Danny Dietz (Emile Hirsch) and Matt Axelson (Ben Foster). Their objective is complicated by the spotty radio contact of the rugged mountain terrain, and matters almost immediately become inordinately more difficult when the SEALs’ position is compromised by a group of wandering goat herders. In no position to take hostages, and lacking the moral authority to kill the interlopers simply on suspicion of Taliban complicity, the American soldiers set their briefly held captives free, and then try to clamber to the safe remove of a rendezvous point before being “contacted” by the enemy. Their efforts are in vain, and a swarm of Taliban fighters descends upon them. While unit commander Erik Kristensen (Eric Bana) scrambles helicopters and struggles to find a way to provide air support, Murphy and his men fight for their lives. Given the title, it’s pretty clear that Lone Survivor will not end well. Yet Berg’s film, for those not already familiar with its story (Murphy was also the subject of Murph: The Protector, a documentary from earlier in 2013), does a good job of generating tension surrounding the soldiers’ predicament. The frantic, stomach-churning shootouts have a transfixing immediacy, and at times are almost more than one can bear. (Shrapnel is pulled out and bones pushed back in.) But it means something, because of how well the characters and their bonds have been established. In 2012, Act of Valor, in an act that could be the most expensive and exclusively sourced military recruitment video to date, used real, active-duty American special forces personnel in service of a jingoistic narrative that peddled tidy, action-oriented conflict resolution. On a technical level, the movie was fairly impressive, but it lacked any dramatic punch whatsoever. Lone Survivor is another mission-defined special forces action film, but much more in line with 2001’s Black Hawk Down, which also chronicled an American military defeat at the hands of a technologically under-equipped enemy. Both films are about courageous, honorable and extraordinarily well-trained men put in untenable situations. In each case they act with focus, allegiance and maximum exertion—until they simply can’t, and are overwhelmed. To argue (as some have) that Lone Survivor is “pro-war” is to conflate personal support and very basic empathetic identification with American soldiers with an endorsement of the broader governmental military policy that employs them. But Berg’s film doesn’t unfold on a chessboard, or even as a game of checkers; it’s purely Tic-Tac-Toe, reactionary and narrowly defined. It doesn’t pass judgment or make a statement on the war against terror. Ergo, if this was a fictional story it seems unlikely that it would garner such criticism. Yes, Lone Survivor is brawny and macho; in its early, pre-combat patches, establishing the camaraderie of its company, it feels like it could adequately slot as a suitable audiovisual booster shot supplement for any of those “low testosterone” commercials that receive heavy rotation during football games and evening newscasts. But for most of its running time, Berg and cinematographer Tobias Schliessler—mixing handheld camerawork with special aerial rigs designed to circumvent the need for cranes and dollies—eschew the slow-motion fetishization of violence. The Sangre de Cristo Mountains of New Mexico substitute convincingly for the scruffy setting of the Hindu Kush mountain range that stretches between Afghanistan and Pakistan, and the rest of the film is likewise staged with considerable attention to detail and authenticity. For all its technical achievement, however, Lone Survivor delivers an emotionally arduous experience. And that’s the point. This isn’t a movie of vicarious catharsis. The rapport of the four main actors—Kitsch, Wahlberg, Hirsch and Foster, ferociously present all—is sterling, and the material locates a humanity amidst much brutality. War is hell. And sometimes it’s okay, and enough, to be reminded of that. Sometimes, we need to be reminded of that.